I’m not sure what the time of year was when Hemingway wrote these words, but I have a feeling he wrote them about this time. The mornings are truly the best part of the day for me; the air is cool as the first light of the coming day creeps in low across the horizon. The dawn chorus of the birds starts up almost all at once after the first calls of the spurfowls echo through the river bed and break the quiet stillness of the previous night. There’s no doubt about it at this point, spring is in full swing. Almost every day I’m hearing and seeing species of birds that have been absent or quiet since last fall. The cloudless skies above are now starting to glow orange, promising another warm day ahead. It’s been very warm here. Downright hot really. The heat does help us though as many animals are sticking closer to the last few waterholes making for great game viewing (just find a spot in the shade to sit!) This past week has been something special, even by Umlani’s typically high standards. 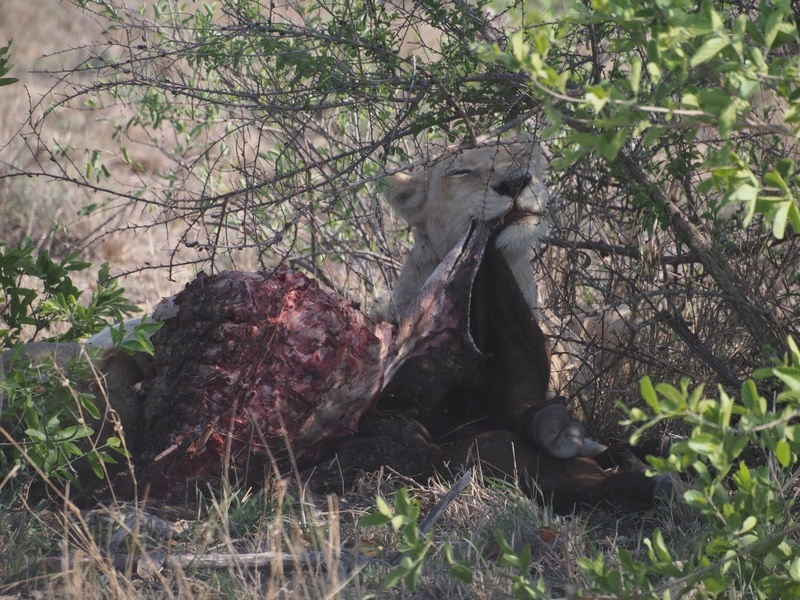 Guests have been treated to 7 different leopards in 7 days, wild dogs, and two prides of lions with young cubs, including the two white lions of the Giraffe Pride on a buffalo kill. 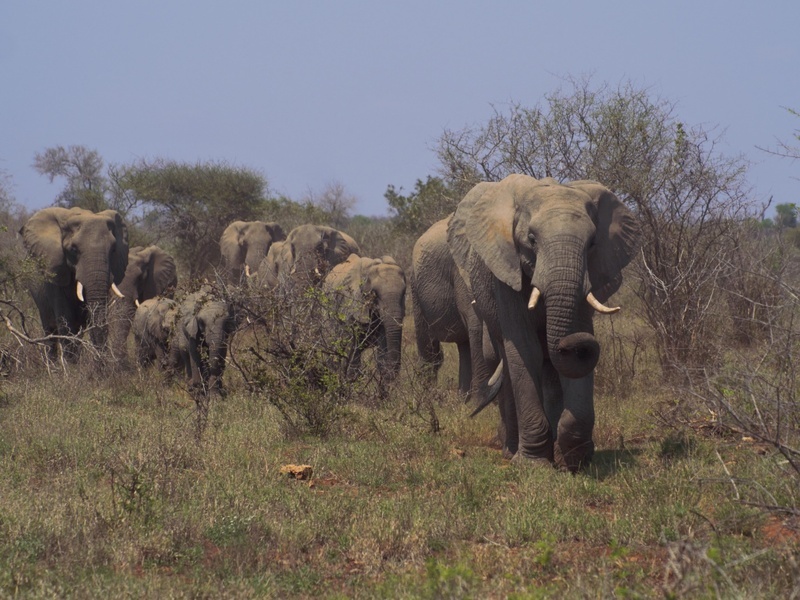 The matriarch leading her herd, on a mission to find water. 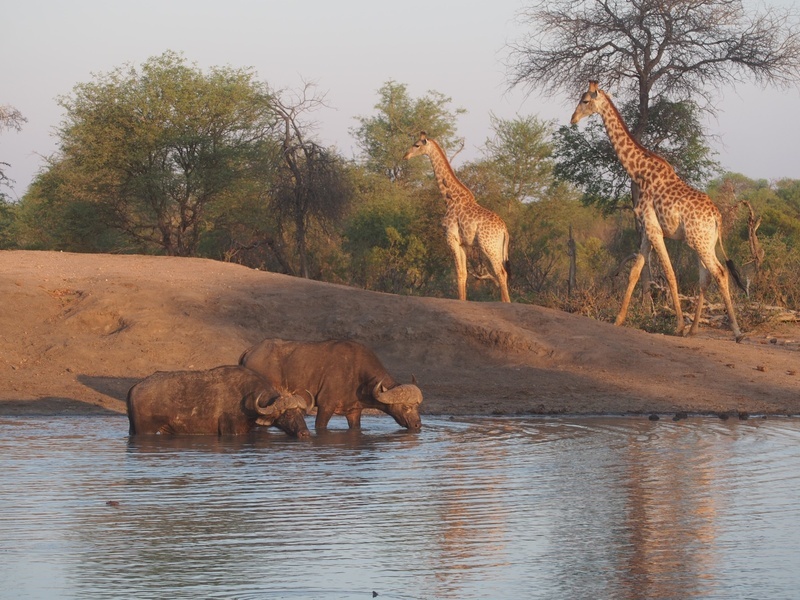 The waterholes are getting non-stop action. Before one group of animals has a chance to finish, another is already arriving and waiting its turn. 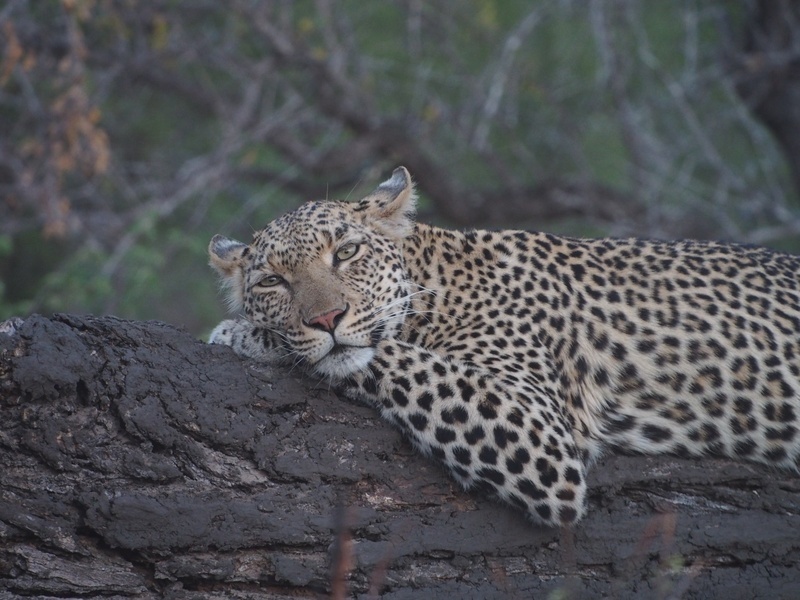 Marula, one of our resident leopards, dreaming for the snows of Kilamanjaro. The cats, make it their goal to move as little as possible during the heat of the day, usually waiting until sundown brings the promise of cooler temperatures to start moving again. Of course sundown also brings the darkness they love for hunting. 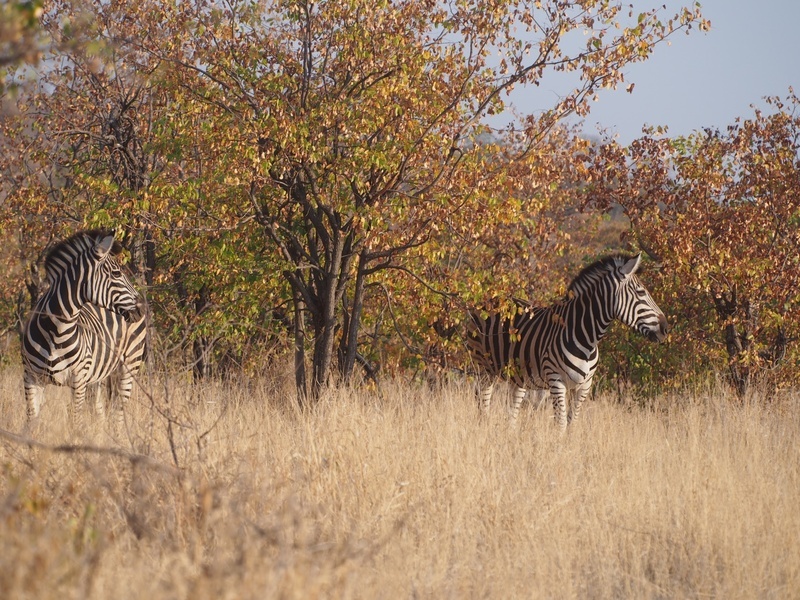 Two zebra stand vigilant, keeping an eye on something that’s caught their attention. One of the white lionesses tearing into a mid-morning snack. The pride followed a big herd of buffalo into the area and hung around just for the day it took them to polish off a young buffalo they’d brought down the night before. Guests were treated to quite the drive this week – we managed to see leopard, these wild dogs and the white lions in a single afternoon. 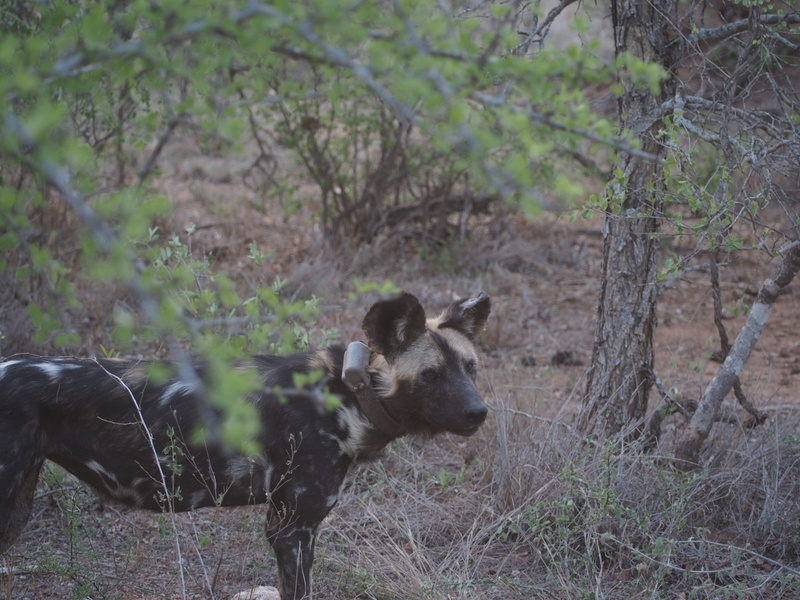 Wild dogs roam over vast distances and rarely slow down long enough for a good photo-op. You can see this one has a radio-collar so biologists can keep tabs on the pack to help manage this rare and increasingly threatened species. 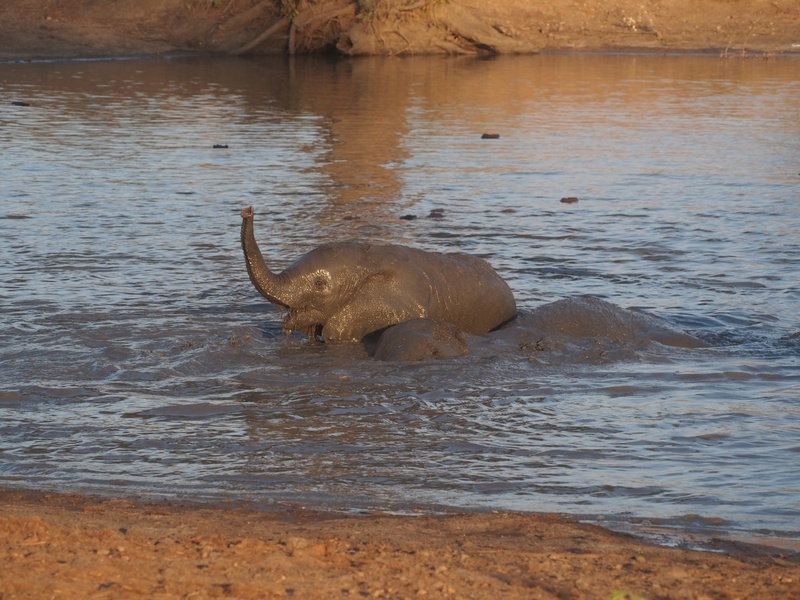 These two young elephants wasted no time diving straight into the waterhole for a much needed cool-down. You can really see the joy on this little ones face. Hope you enjoyed last week’s highlights as much as we have. And here’s one last photo of a baby lion doing the equivalent of sucking its thumb to hold you over until next week!